Will Washington, D.C. be nuked? THE NEXT COMING FALSE FLAG ATTACK ON US SOIL? Try to physically prepare if you can but be sure to spiritually prepare (this is not optional) because we are about to experiment a big shift anyway. December 21st 2012 will not be the end of the world but sure will be the end of the world as we know it. IS MARCH 8TH 2012 THE NEXT FALSE FLAG OPERATION COMING ON US SOIL? Have you protected your copyright yet? Copyright piracy is estimated to cost millions every year. Before letting anyone see your work, make sure you’ve registered your work for copyright protection…Marie M. Buchanan, M. Psy. I recently discovered that the American Continent is the Economic Babylon of Revelation 18..
We will go through a FALSE FLAG NUCLEAR attack coming on US soil soon. Canada will not be spared but will have less damage than US. If you have money, get out the American Continent now. Time to spiritually and physically prepare instead of shooting the messenger as this will be more profitable for you to do so. The stage has been set for a nuclear false flag in America. which might be the case. Not that I look forward to his murder/execution, (I don’t) but I am being realistic to have in mind that he is of old age. God says in his word to not rejoice that anybody dies, no matter how evil this person is so please do not consider this as opportunism because in fact, I had been taken advantage of by a real opportunist who wants to put his name on my book and sell it! That’s why I am being aggressive to sell this book first IS ALL. The Bible teaches that God has no pleasure in the death of the wicked. Ezekiel 33:11, “Say unto them, As I live, saith the Lord GOD, I have no pleasure in the death of the wicked; but that the wicked turn from his way and live: turn ye, turn ye from your evil ways; for why will ye die, O house of Israel.” If we are to be Christlike, then we must not rejoice in the death of the unsaved. It is a sad thing when someone dies and goes into Hell. To the smartest and best offer! The Pope will die within the next 12 months, a senior Vatican figure has reportedly claimed amid fears of an assassination plot. The sensational prediction was allegedly made by Cardinal Paolo Romeo, the archbishop of Palermo in Sicily, on a recent visit to China. Cardinal Romeo reportedly made the startling prediction of the Pope’s death during a trip to China in November 2011. He seemed so sure of the fact that the people he spoke with, including Italian businessmen and Chinese representatives of the Catholic Church, were convinced that he was talking about an assassination attempt. They were so alarmed by his remarks that they reported them back to the Vatican. The Vatican has reportedly opened an investigation into the claims. The report was written in German, apparently to limit the number of people within the Vatican who would understand it if it was inadvertently leaked. It warns of a “Mordkomplott” – death plot – against Benedict. The story was broken on Friday by an Italian daily, Il Fatto Quotidiano, with the headline “Plot against the Pope – he will die within 12 months”. The newspaper, which has a reputation for scoops, published a page from the confidential report. 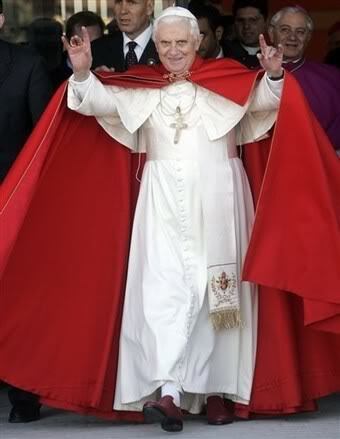 “During his talks in China, Cardinal Romeo predicted the death of Benedict XVI within 12 months. His remarks were expressed with such certainty and resolution that the people he was speaking to thought, with a sense of alarm, that an attack on the Pope’s life was being planned,” the paper reported. “It is so outside of reality that it should not be given any consideration,” Romeo was quoted by Italian news agency ANSA as saying. The Vatican’s spokesman, Father Federico Lombardi, said the report was “so incredible that we cannot comment on it”. He did not deny the existence of the document to AFP, but added that it was “devoid of reality”. Cardinal Romeo also named Benedict’s XVI likely successor as Cardinal Angelo Scola, the archbishop of Milan – meaning the papacy would return to an Italian after the German Benedict and his Polish predecessor, John Paul II. He allegedly told his contacts in China that Pope Benedict could not stand Tarcisio Bertone, his Secretary of State and the Vatican’s second most senior figure, amid reports of bitter power struggles going on within the Holy See. Cardinal Romeo said Benedict viewed Cardinal Scola as his ideal successor because they had similar personalities and theological outlooks. Cardinal Scola was previously the Patriarch of Venice, but was promoted to the archbishopric of Milan by Benedict in June last year. The most recent attempt on a pope’s life was in 1981 when John Paul II was shot and critically wounded in St Peter’s Square by Mehmet Ali Agca, a Turkish gunman with links to a shadowy militant group called the Grey Wolves. It has been claimed that the assassination attempt was backed by the KGB and Bulgarian secret service, in retaliation for the pope’s support for the pro-democracy Solidarity movement in his native Poland and his opposition to Communism.